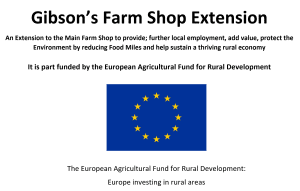 Gibson's Farm Shop is a family run business located in the beautiful Kent Countryside just outside of Wingham, Canterbury, Kent. Established in 1970, we believe in offering the best foods that Kent has to offer. Come and find us today! Nice surroundings and pleasant staff. The cafe comes top of our list of places to cycle or walk to for coffee and cake within a 15 mile radius and the farm shop has a great range of products including a butcher, frozen ready made meals and a florist.